AP Inter Second 2nd Year 2018 Exam Time Table Download- Andhra Pradesh Senior Inter Examination Schedule 2018 Download available from bieap.gov.in website. 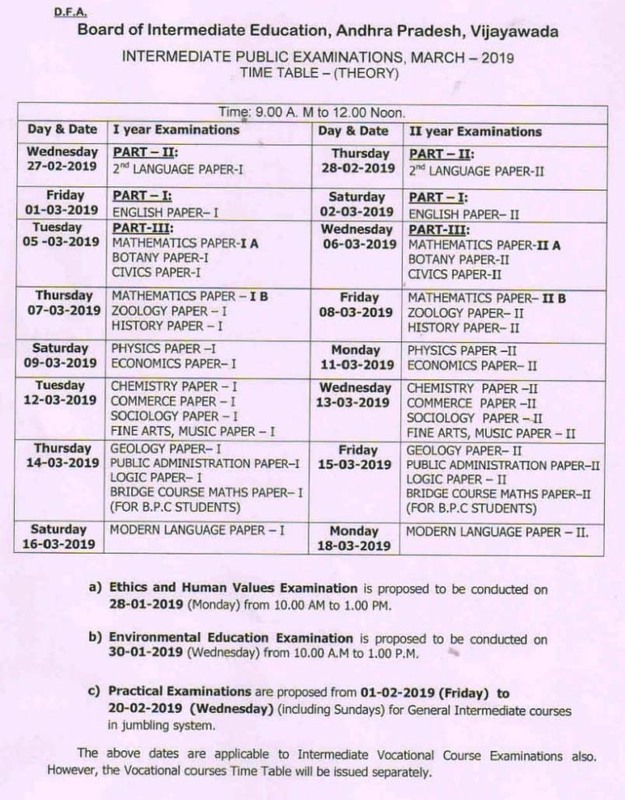 Board of Intermediate Education, Andhra Pradesh BIE AP conducting Intermediate 2nd Year Examinations in the Month of March 2019, Every year Inter Board conducting both first year and second year examinations in the month of March. The AP Senior and Junior Intermediate conducting 2nd Year examinations from 28th February 2019 to 18th March 2019. Practical Examinations to be conducting from 1st February 2019 to 20th February 2019. 11th March 2019 PHYSICS PAPER–II, ECONOMICS PAPER–II. 18th March 2019 MODERN LANGUAGE PAPER – II. a) Ethics and Human Values Examination is proposed to be conducted on 28th January 2019 (Monday) from 10.00 AM to 1.00 PM. b) Environmental Education Examination is proposed to be conducted on 30th January 2019 (Wednesday) from 10.00 AM to 1.00 PM. c) Practical Examinations are proposed from 1st February 2019 to 20th February 2019 (Including Sundays) for General Intermediate courses in jumbling system. The above dates are applicable to Intermediate Vocational Course Examinations also. However, the Vocational courses Time Table will be issued separately.